Our Warehouses Are Full Of Portable Sound Systems That Ship Fast! This Large Speaker Includes A Tripod, Protective Cover, Amplifier & Microphone Stand! For audiences up to 7,500 in rooms up to 25,000 sq. ft.
Make sure you are heard all the way in the back with this amazing portable audio system package with remote control. Roam up to 300 ft away from the system with the included wireless handheld microphone. Also included is a wired microphone with XLR plug and a 25 ft cable. With separate lever controls for each of the three microphone/line lever channels and auxiliary function this system gives you great control over your presentation. 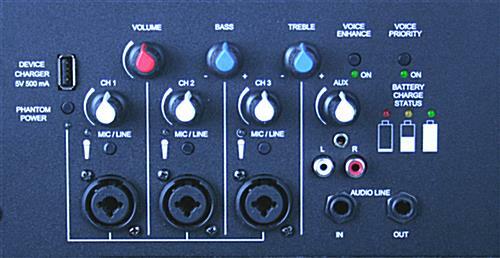 The built-in talk over technology allows automatic reduction of music when presenter is speaking with microphone. A line level output is ideal for using In-House PA systems without having to learn how a hotel or lecture hall system works before a presentation. The built in 10" woofer and 4" tweeter are great for a 25,000 sq. ft. area and up to 7,500 people. Even if power is not available for the internal power supply/charger the built-in rechargeable battery will give you up to 10 hours of run time. With the ability to run on 110V or 220V AC you will never have to worry about how to power the system. The build-in pocket handles make it easy to lift into and out of your car or onto the stage and the retractable handle makes it easy to move using the tilt 'n roll wheels. This kit is our PW915 Basic Audio Package but we have added a mic stand, tri-pod and carrying bag for all your accessories.